I described attacks on the Phillips Curve in Part 2. This part discusses the history of the Phillips Curve in detail, and concludes with a discussion of the problems revealed by the failure. The Observations are the fun part if this is too long. … replaced discontinuous and qualitative descriptions by a quantitative hypothesis based on an unusually long history of evidence. Since 1861 there had been a regular negative relationship in Britain between the unemployment rate and the growth rate of the nominal wage rate. P. 12. Gordon says “… the inflation rate would be expected to equal the growth rate of wages minus the long-term growth rate of productivity.” P. 12. 2) p = -.90 + 9.64U-1.39 – k.
Paul Samuelson and Robert Solow discussed the Phillips results in the US context in a 1960 article. They found no similar data for the US, but they did some estimates and suggested that the PC doesn’t fit their data for several periods, and that it can shift up and down. Phillips estimated that an unemployment rate of about 2.5% was consistent with zero-inflation, while Samuelson and Solow think it might have been 3% pre-World War II and was about 5-6% in the early 60s. The reduced form of this approach implied that the inflation rate depended on the level and rate of change of unemployment, perhaps other measures of demand, and lagged inflation. The required condition for continued full employment is the opening of a gap between the growth rate of nominal GDP and the growth rate of the nominal wage to make room for the increased nominal spending on oil. P. 21, cite omitted. The second U term is the “natural” rate of unemployment, which I’m not going to take up. The z term represents cost-push pressure from unions and supply monopolies. The e term is apparently a constant but it seems odd that it might vary over time. Gordon explains that this version incorporates inertia, the idea that if there’s inflation in one period, there will be inflation in the next. It also reflects supply and demand issues, like wage and price rigidity. That problem, says Gordon, is “fruitfully ignored”. We don’t need to consider wages, we just look at prices. With these changes, we can understand the past by explaining away variations with negative or “beneficial supply shocks” and other variables. Gordon says that Equation 3 is foundation of the mainstream model. There is a related model, the New Keynesian Phillips Curve which is similar except that it incorporates future expectations of inflation, and makes no specific provision for supply and demand shocks. I assume these in some combination are the models used by the Fed, and heavily criticized as discussed in Part 2.
probability. Dialectic of Enlightenment, Horkheimer and Adorno,p. 3. As it happens, and perhaps not surprisingly, Phillips’ Equation 1 doesn’t work on US data. 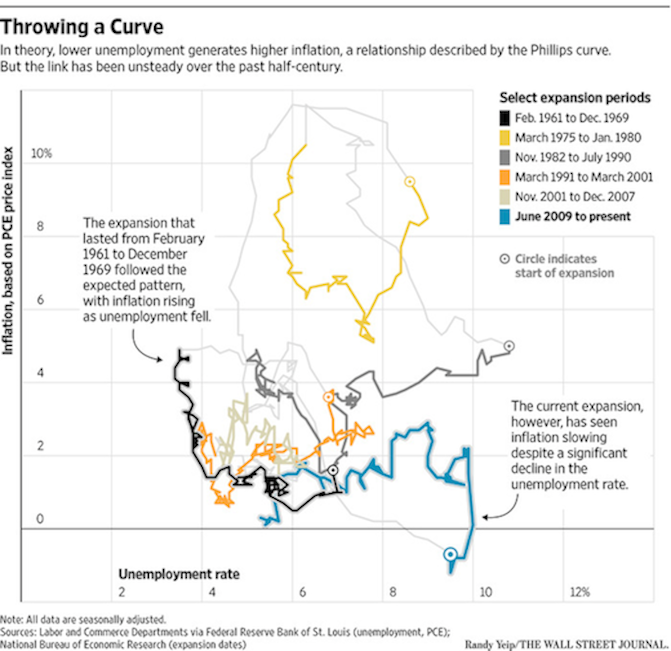 Gordon himself and others start adding things to make the Philips Curve work. They are convinced that there is a link between unemployment and inflation, and that they just need to add the relevant variables from their theoretical arsenal to get it to come out. Some focus on expectations, others on supply and demand shocks, and others add taxes or something else. Once they get those pesky variables set up, it’s just a matter of solving for constants. The point is to fit a curve to the actual data, not to use the actual data to see what’s happening. The concept connected to the real world is gone, replaced by the formula. The cause is replaced by the rules of economics. 2. If we set inflation at 0 in Equation 1a, the rate of wage growth is equal to the rate of productivity growth. As the above chart shows, this relationship broke about 50 years ago. 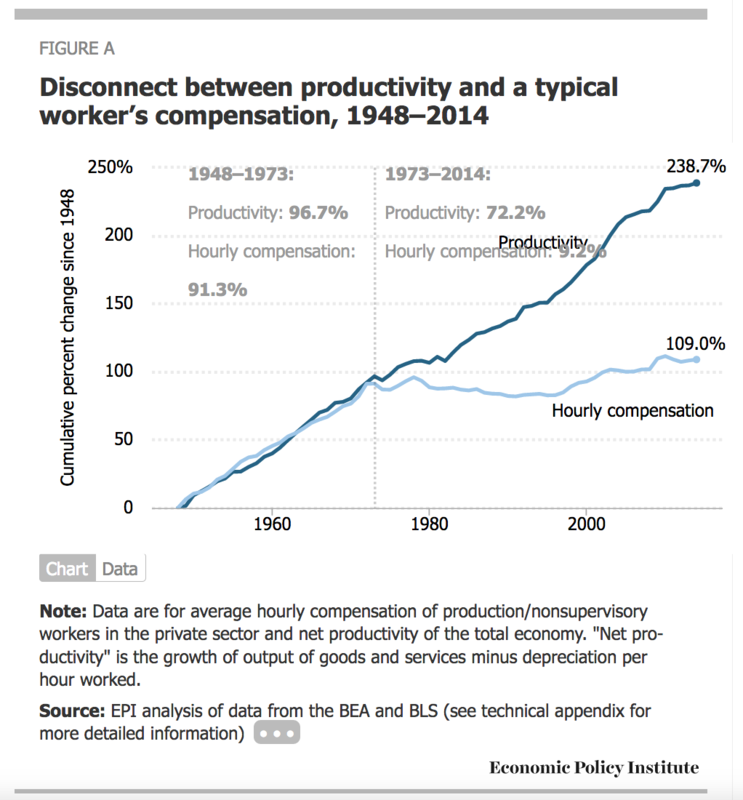 If all the gains from productivity are not going to labor, they are going to capital. Of course, capital takes several forms, for example, housing, agricultural land and other domestic capital. See, Piketty, Capital in the Twenty-First Century, Figure 4.6. When you think about it, it seems almost impossible that some of the gains from productivity weren’t going to capital all along. But in the current economy, it’s obvious that companies like Facebook can provide vastly more services with disproportionally fewer additional employees, few of whom are well paid, so that most of the gains from increased sales go to capital. Or, suppose that manufacturing is outsourced, reducing labor costs. Some of the gains might go to cutting prices but surely some go to capital. Let’s rewrite Equation 1a to reflect this, using γ for the growth rate capital. 1b) p = w + γ – k.
4) p = -.90 + 9.64U-1.39 + γ – k.
It also calls attention to the fact that nowhere in Gordon’s paper is there a mention of power, market power, political power, or social power, all of which Piketty talks about. Actually, hidden away in Gordon’s article is a backhanded reference to power. Equation 3 (Equation 7 in Gordon’s paper) includes a term “…zt to represent ‘cost-push pressure by unions, oil sheiks, or bauxite barons’”. P. 22. Obviously Gordon understands that the power to control the price of goods and services could create a negative supply shock, and the loss of control could produce a beneficial supply shock. P. 25. However, this is not explicit, and it certainly doesn’t deal with our current economy, in which almost all goods and services are dominated by a small number of gigantic companies exercising a significant degree of price control. The tweaking Gordon describes might work for a while, but as the degree of price control through monopoly and oligopoly power increases, and γ becomes a bigger factor, the tweaks quit working. 3. Let’s put this in a larger context. For many economists, the Phillips Curve is structural. But why would you think so? It seems more likely that the relationship holds in a certain set of social conditions, including legislation and regulation, power conditions, and people’s attitudes. A logical use of the data is to work out the conditions that must exist to make it so. That’s how Piketty approaches his inequality data. A number of papers at the conference highlighted that some of the economic relationships that are frequently assumed to be stable over time have proven to be not so stable as we have come out of the financial crisis. These structural changes mean that if you tried to have a model that was fairly invariant to these changes, or a process that was invariant to these changes, there would start being big misses in monetary policy. He goes on to explain that we have to raise interest rates because maybe not the Phillips Curve, but when employment goes up, inflation goes up. Rosengren knows there’s a problem, but he doesn’t have any idea of how to cope, so he keeps doing what he thinks he knows is right. It’s another example of Horkheimer and Adorno’s statement in action. Updated to define γ more exactly. Increasing the amount of money in the economy stimulates the overall level of spending and thus the demand for goods and services. Higher demand may over time cause firms to raise their prices, but in the meantime, it also encourages them to hire more workers and produce a larger quantity of goods and services. More hiring means lower unemployment. This line of reasoning leads to one final economy-wide trade-off: a short-run trade-off between inflation and unemployment. The frightened people were, of course, proven absolutely wrong, though they won the policy argument with the imposition of the Sequester. The stimulus package was too small, though at least it more or less happened, and of course spending on the military increased, which helped, though it would have been nice to have something for the money besides the worthless F-35. This discussion is fleshed out beginning at about page 490 (in the 6th Ed.) with a long discussion of the Phillips Curve. This Wikipedia entry is at least cheaper than buying Mankiw’s book. for those not familiar with the subject. This isn’t so much a principle in the sense of an axiom as it is a theorem, worked up from axioms. The source of the idea is a 1958 paper by William Phillips, showing an historical correlation between inflation and unemployment in the UK, and extended to US data by Paul Samuelson and Robert Solow. The correlation and the explanation worked together to persuade people that both the grounds of explanation and the relationship were more or less permanent features of the economy. The ideas behind the explanation are neoclassical, so the correlation served to validate those neoclassical ideas. Recently the Wall Street Journal published an essay by Ben Leubsdorf discussing the current understanding of the Phillips Curve debate: The Fed Has a Theory. Trouble Is, the Proof Is Patchy. [Paywall]. Jared Bernstein discusses it in this post and links to this New York Times post; both are worth reading to see just how unhinged we are from the simple explanation offered by Mankiw. This chart is from the WSJ article. But the simple link between U.S. unemployment and inflation described by the Phillips curve appeared to break down after the 1960s. High inflation coexisted with high unemployment in the 1970s. In the 1990s, the jobless rate fell as price pressures weakened. Over the past three years, inflation has declined despite a falling jobless rate. Mankiw says there is dispute among economists about this, and Leubsdorf confirms that. He says that a recent WSJ survey found that 2/3 of economists “believed that the link exists.” Here’s a quote from a believer, Atlanta Fed President Dennis Lockhart. “In the absence of direct evidence that inflation is in fact converging to the target and in the absence of compelling or convincing direct evidence, I think a policy maker has to act on the view that the basic relationship in the Phillips curve between inflation and employment will assert itself in a reasonable period of time as the economy tightens up …. One of Mankiw’s (2014) ten principles of economics is, “Society faces a short-run tradeoff between inflation and unemployment.” This tradeoff, the Phillips curve, is critically important for monetary policy and for forecasting inflation. It would be extraordinarily useful to discover a specification of the Phillips curve that fits the data reliably. Unfortunately, researchers have repeatedly needed to modify the Phillips curve to fit new data. Friedman added expected inflation to the Samuelson-Solow specification. Subsequent authors have added supply shocks (Gordon, 1982), time-variation in the Phillips-curve slope(Ball et al., 1988), and time-variation in the natural rate of unemployment (Staiger et al.,1997). Each modification helped explain past data, but, as Stock and Watson (2010) observe, the history of the Phillips curve “is one of apparently stable relationships falling apart upon publication.” Ball and Mazumder (2011) is a poignant example. Even today people are looking for a way to find something useful in past data to predict future outcomes. As Leubsdorf noted, the Fed is using some version of this curve in deciding when to raise interest rates. So, how does this fit with neoliberalism? 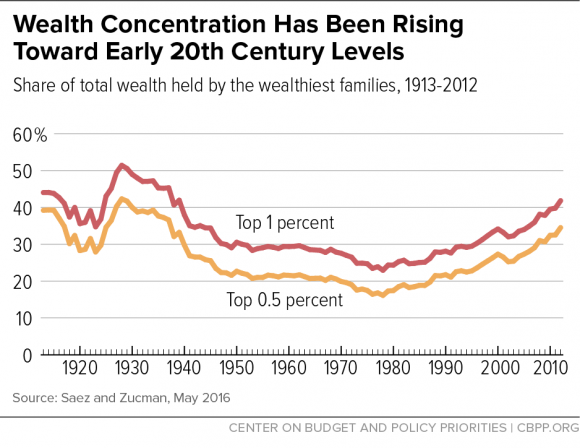 One of the goals of neoliberal economics is the protection of established wealth. Inflation erodes wealth. Returns to capital may or may not keep up with inflation, depending on the strength of labor and other factors of production. Debtors are able to repay their debt in less valuable dollars, which erodes the assets of creditors. If the increased returns are less than the erosion, wealth suffers. As we have seen in the wake of the Great Crash, the governing power structure of neoliberalism demands that capital be protected whether in the form of equity or debt. This principle tells policy makers to put people out of work rather than suffer inflation. The Fed follows this principle. This is a chart of the labor share of income. The gray vertical bars are recessions. 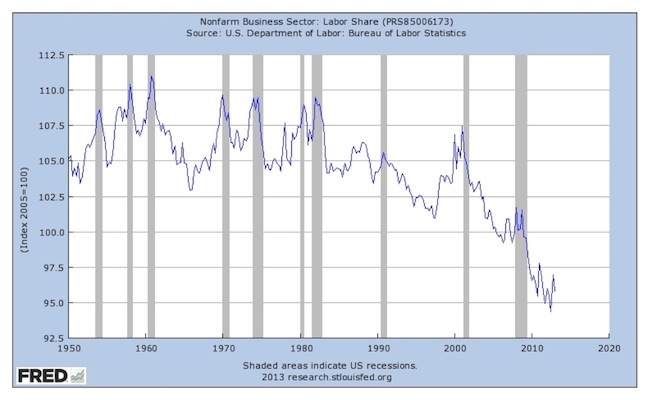 The chart shows that as the labor share rises, we get a recession. 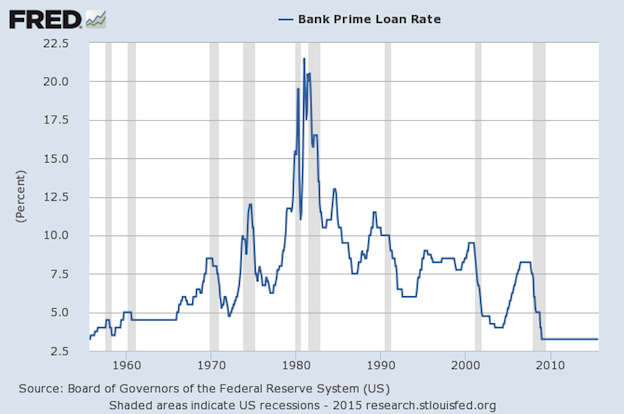 The following chart shows bank prime rates. As interest rates rise, we get recessions. With the exception of the recession that followed the Great Crash, it’s fair to say that all of these recessions were engineered by the Fed because of inflation or fear of inflation. The implications are fascinating. Before the Great Crash, almost all US money was created by bank lending and credit expansion. Mankiw’s Principle No. 9 tells us that when too much money is created, we get inflation. The Phillips Curve tells the Fed it has to raise interest rates to stem inflation, and that it does so at the cost of putting people out of jobs. So, businesses lend and borrow too much, creating inflation or fear of inflation, and to solve the problem created by the failure of capitalists, the Fed makes sure only the working people pay the price, by losing their livelihoods, and lately, by watching their incomes stagnate or drop. And that is the outcome of applying Mankiw’s Principles of Economics: damaging workers to protect the rich. 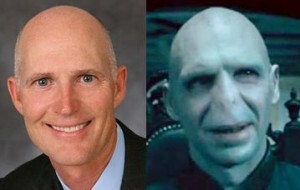 Scott’s attempts to look human are hampered by his striking resemblance to Voldemort. Rick Scott was elected Governor of Florida in 2010 by a razor-thin margin that many attribute to his strong support from the Tea Party movement. A large portion of that support was garnered through his highly public opposition to President Obama’s Affordable Care Act. However, with the small exception of my Congressional district electing batshit crazy Tea Partier Ted Yoho in 2012, it appears that the Tea Party is on a bit of a retreat in Florida and so, with Charlie Crist now looking like a very formidable opponent for the 2014 gubernatorial race, Scott is systematically reversing his position on a number of issues away from the crazy and toward both the human and the humane. “I am flabbergasted. This is a guy who, before he was a candidate for governor, started an organization to fight ‘Obamacare’ in the expansion of medical entitlements. This is a guy who said it will never happen on his watch. Well, here it is,” said Slade O’Brien, Florida director of the conservative group Americans for Prosperity. In other words, AFP notes that Scott was just one more of their huge investments that produced very poor returns. More than one percent of all Americans–3.3 million people–will have lost their unemployment benefits by month’s end if Congress doesn’t pass an extension of long-term benefits. The Labor Department estimates that about 1.7 million have lost benefits as of last week, after extended unemployment insurance expired in late May. Those numbers could reach 3.3 million by the end of the month if Congress doesn’t pass an extension after it returns from recess next week. A bigger concern is the number of people who may lose benefits this month. The tally of people continuing to claim benefits plunged to 4.4 million, the department said. But that doesn’t include an additional 4.6 million people who received extended benefits paid for by the federal government in the week that ended June 19. That’s the latest period for which data are available. Diane Swonk, chief economist at Mesirow Financial, said many people losing extended unemployment may seek aid through Social Security, food stamps and welfare. Other economists noted that the end of extended benefits could cut Americans’ incomes by as much as $41 billion, potentially reducing consumer spending in the coming months. Think about that for a minute. More than one out of every hundred people has been unemployed for so long the Republicans and deficit hawks in Congress think they’re just slacking and should be cut off. Of course, those one out of every hundred people aren’t evenly distributed throughout the population: the less educated, people of color, and people over 50 are suffering disproportionately during this recession. Nevertheless, they represent a huge chunk of our neighbors, our customers, our family members. And our country seems to have decided they and those who depend on them are expendable.